Lion down: Harvard sophomore defensive back Max Jones halts Columbia tight end Rory Schlageter. 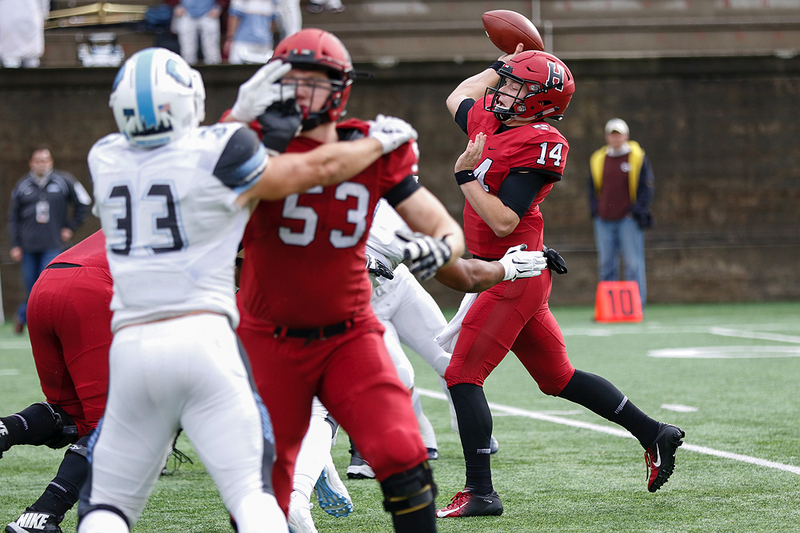 Senior’s Day: Harvard’s senior quarterback Tom Stewart had a game for the ages, throwing five touchdown passes, including the three longest in Crimson history. Back Bookin’: Oft-injured senior runner Charlie Booker III got back in gear with a 34-yard touchdown run that capped the scoring. 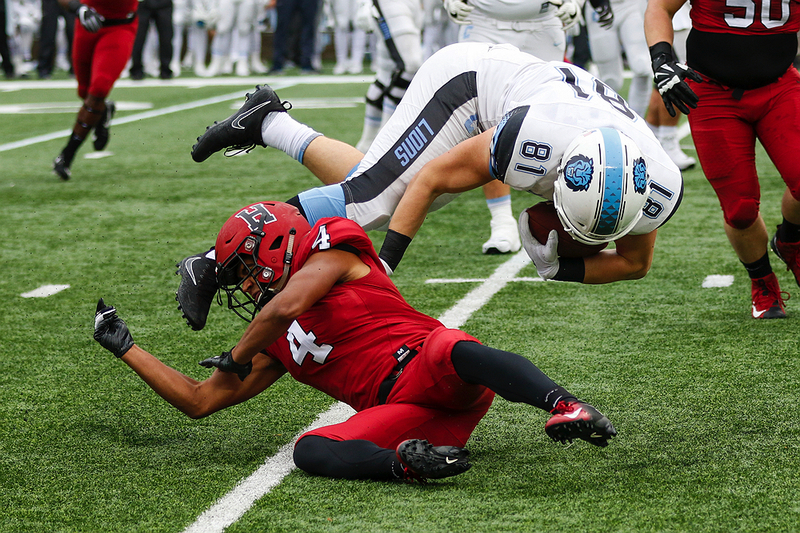 Because Saturday’s clash with Ivy League rival Columbia was the Harvard football team’s final game at Harvard Stadium this season, it was designated Senior Day, the afternoon on which the players from the class of 2019 were honored. (The final home game, against Yale, will be at Fenway Park.) Appropriately enough, one senior had a career day and several others figured heavily in the outcome. Quarterback Tom Stewart, who during his Harvard tenure didn’t get significant playing time until the middle of this season, had quite a first quarter alone, firing three long touchdown passes (including the longest in Crimson football history) and getting Harvard off and winging to a 52-18 victory. The win raised the Crimson to 4-4 overall and 2-3 in the Ivy League. The Lions dropped to 4-4, 1-4. He didn’t waste any time, taking advantage of relatively calm conditions in the first half before the wind kicked up and made throwing long more challenging. A penalty on the opening kickoff return set Harvard back to its eight-yard line. Then—zip! On first down Stewart threw caution to the winds as well as one of the sweetest passes you’ll ever see. Dropping back, he launched a Scud missile some 65 yards in the air that hit streaking junior wideout Jack Cook in stride. In a twinkling Cook, who had beaten Columbia’s Will Allen, was over the goal on that record-breaking, longest Crimson pass play, 92 yards in all. Junior Jake McIntyre booted the extra point. Twenty seconds into the game, it was Harvard 7, Columbia 0. Later in the first period, Lions kicker Chris Alleyne made a 32-yard field goal. Harvard 7, Columbia 3. Then—bang! On the Crimson’s first play from scrimmage following the kickoff, Stewart took the snap and scanned the field. Sophomore wideout Tyler Adams was open downfield. This time, Stewart put just the correct amount of loft on the ball and dropped it into Adams’s arms—right into the pickle barrel. Adams took it the rest of the way for a 75-yard score. McIntyre kicked. Harvard 14, Columbia 3. The Lions responded with an 83-yard drive that produced another Alleyne field goal, this one a 29-yarder. Harvard 14, Columbia 6. Then—pow! This time the Crimson quarterback had to wait until third down to produce a big play. Seeing sophomore running back Aaron Shampklin alone near the left sideline after wheeling out of the backfield, Stewart hit him with a toss. Shampklin blazed the remainder of the 74 yards. McIntyre booted. Harvard 21, Columbia 6. Fewer than 12 minutes had been played. Up until now the scoreboard had been blinking like a pinball machine, but the game soon settled down and the Lions crept back. In the middle of the second quarter, Columbia’s Mike Roussos made a nifty return of a punt by Harvard freshman Jon Sot, taking the ball to the Crimson 35. Four plays later the Lions were in the end zone on a two-yard run by Kyle Castner. But on the extra-point try the snap was bungled. Harvard 21, Columbia 12. Thirty-nine seconds remained till halftime. On first down, Stewart danced to his left and whipped the ball into the back of the end zone. Senior wideout Henry Taylor leaped, snagged it, and somehow kept his feet inbounds when he came down. Touchdown! McIntyre kicked. Harvard 28, Columbia 12. As the third quarter began, the senior connection of Stewart to Taylor again provided a spark, this time with a pair of completions that helped bring the ball to the Lion six-yard-line. On first and goal, Shampklin glided up the middle and into the end zone. McIntyre converted. Harvard 35, Columbia 12. This touchdown took some of the pressure off, but more than 25 minutes of play remained. The rest of the third quarter produced a scoreless standstill. (Leading Harvard with eight tackles on the day was defensive back and captain Zach Miller. Yes, a senior.) 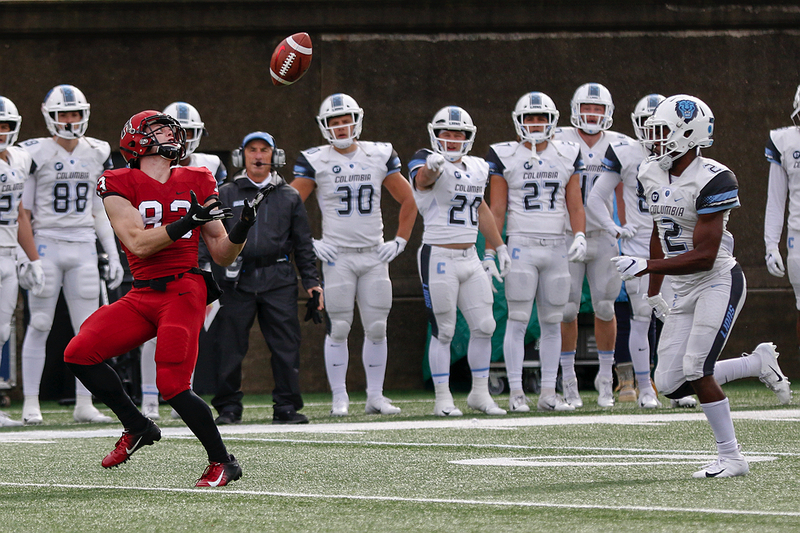 On the first play of the fourth quarter, the snap sailed over the head of Columbia punter Drew Schmid and out of the end zone for a safety and two-more Crimson points. Harvard 37, Columbia 12. The Lions now would need four scores to gain the lead. They got one of them on a 20-yard pass from Ty Lenhart to Kaleb Pitts, but Lenhart failed on a two-point conversion run. Harvard 37, Columbia 18. Stewart wasn’t through. Instead of producing a quick strike, he led the Crimson on a meticulous, 10-play, 62-yard drive that yielded another senior-connection touchdown pass to Taylor, a 10-yarder. McIntyre kicked the extra point. Harvard 44, Columbia 18. The points were welcome, but so was taking five minutes off the clock. McIntyre then blasted the ensuing kickoff through the uprights. The punctuation was provided by yet another senior, running back Charlie Booker III. Booker was All-Ivy in 2017 but injuries have limited his 2018 playing time. After the Crimson defense forced the Lions to surrender the ball at the Columbia 34, sophomore quarterback Jake Smith (doing mop-up duty for Stewart) handed to Booker, who barreled up the middle and accelerated into the end zone. McIntyre’s point after was blocked but tight end Cecil Williams picked up the ball and carried it into the end zone for two points. Harvard 52, Columbia 17. Williams is—you guessed it—a senior. Tidbits: Harvard has not lost to Columbia at Harvard Stadium since September 16, 1995, when the Lions won 28-24….Columbia’s punter, sophomore Drew Schmid, is the brother of Zach Schmid ’18, who was Harvard’s punter from 2015 through ’17….Saturday’s victory marked the first time in two seasons that Harvard scored more than 50 points. 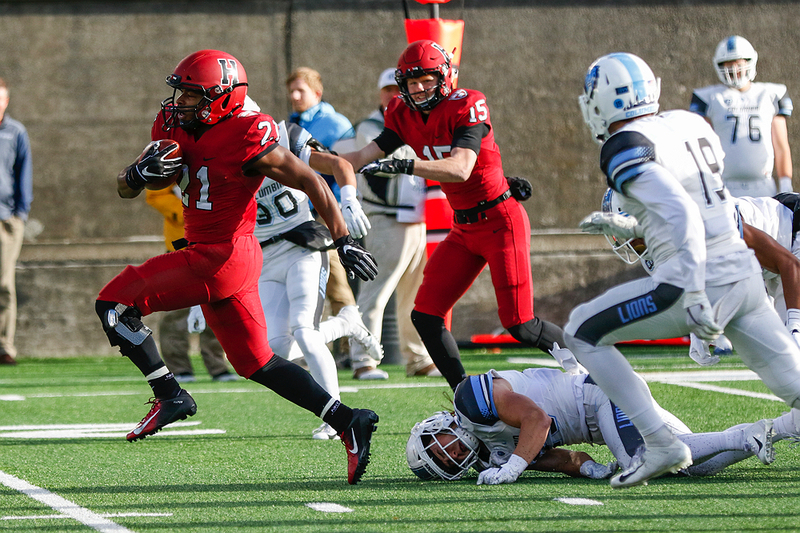 The most recent previous occurrence came on September 16, 2016, when the Crimson beat Rhode Island 51-21. The Real Game, 2018—The Outcome: In the Ivy League’s battle of unbeatens, Princeton outlasted Dartmouth 14-9. In our prediction we got the winner right, but we way overestimated the point total (Princeton 34, Dartmouth 20). So we will refrain from predicting the outcome of Tuesday’s midterm elections. The Tigers’ two remaining games are at Yale and back home against Penn, while the Big Green has it easier, playing at Cornell and in Hanover against Brown. Coming up: Next Saturday, for its final road game of the season, Harvard travels to Philadelphia’s Franklin Field to face Penn. Kickoff: 1 p.m. The game will be streamed on ESPN+ and broadcast on the radio on WRCA 1330 AM, 106.1 FM and 94.5 FM-HD2, and on WHRB FM 95.3. The Quakers are 6-2 overall and 3-2 in the Ivy League. The Crimson leads in the overall series 48-38-2, but Penn has won the last three, including a 23-6 victory last year at Harvard Stadium. A previous version of this story stated incorrectly that the game included the three longest touchdown passes in Harvard history. In fact, the record book prior to Saturday listed 13 scoring passes longer than 75 yards, and 15 longer than 74 yards. Quarterback Tom Stewart’s bolt to receiver Jack Cook this past Saturday, however, topped them all, at 92 yards.